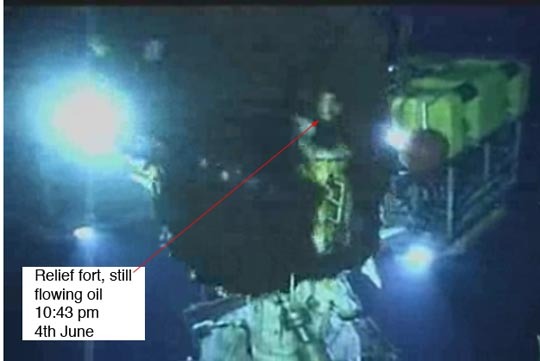 There has not been much change down on the sea bed where last evening BP were able to put a cap onto the short riser section coming out of the Lower Riser Assembly (LRA) that sits on the Blowout Preventer (BOP) at the top of the well. I have looked in a variety of places for information on steps forward, and did discover that there is a second assembly above the cap, that I had seen, but had not been able to recognize until watching the video on capping available at the Deepwater Response site. It is here that the methanol is sent down to the cap to make sure that no crystals form within the cap. So for those who wish to keep the right names for the right parts, take note. The cap, drill pipe, LMRP and riser assembly used to cap the well. And given that I was calling the cap the 7th generation LMRP when it was (as the big 4 on the side of the yellow structure showed) neither, means I need to take my own message to heart. In this post I am going to talk about the seal under the cap. There are four ports on the top of the cap, that continue to allow the oil that is flowing into the cap to flow back out while the cap was initially positioned, and to reduce the flow up the BP, until the system has been checked out to ensure there are no unforeseen problems. BP only slowly raised the flow rate up the pipe when they first started using the Riser Insertion Tool (RIT) starting out with a flow of around 1,000 barrels/day and then ramping it up, at the time reporting that flow ramped up first to 2,000 bd and then up to 4,000 bd. However they later rescinded the latter number and dropped the maximum flow level to around 2,200 barrels a day. Oil and gas have started flowing up to the drillship at the top of the riser where the oil is separated and stored, and the gas is being flared. (This was taken during the flare from the RIT operation). However the flow out of the RIT was monitored, and higher rates have now been reported. 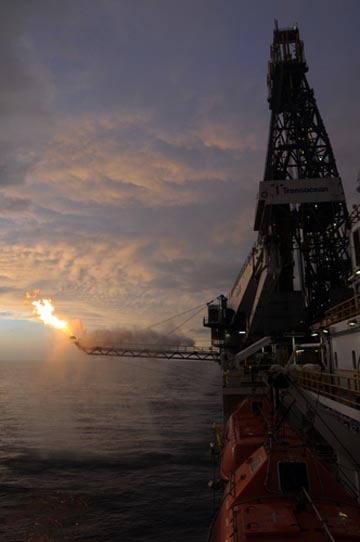 On May 25, 2010, at approximately 17:30 CDT, the RITT logged oil collection at a rate of 8,000 barrels of oil per day, as measured by a meter whose calibration was verified by a third-party. Based on observations of the riser, the team estimated that at least 10% of the flow was not being captured by the riser at the time oil collection was logged, increasing the estimate of total flow to 8,800 barrels of oil per day. Factoring in the flow from the kink in the riser, the RITTI Team calculated that the lower bound estimate of the total oil flow is at least 11,000 barrels of oil per day, depending on whether the flow through the kink is primarily gas or oil. With the full flow now being emitted through the single confluence of the riser and BP flows at the top of the remaining riser section on the BOP, a full estimate of the leak will, no doubt, not be long in being announced. The high volume of flow means that there need to be cautious progress in capturing all the oil and gas and sending it up the DP. However there is still a little communications conflict, since there were some reports that the taps bypassing the oil/gas would be closed later today, however at 10:43 pm the Enterprise ROV 2 was still showing an open port. Oil was also leaking out of the bottom of the cap, which is, even when almost all the oil is being recovered, likely to be a good thing in small quantities, somewhat less than this. 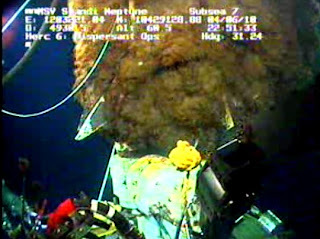 From Skandi ROV 2 10:55 pm 4th June (The Skandi Rov 1 has the picture from the other side, also of the bottom of the cap). Why is this? Well the way in which the Shear was used to cut the end of the riser and BP means that it is likely to be impossible at the present time to get a good strong seal around the chamber between the flow into the cap from the BOP and that out into the BP up to the LMRP. When a stream enters a chamber through one port, and exits through another, both of relatively small size, then the jet will create a vacuum in the chamber, which pulls fluid from the surroundings into the chamber and carries it, with the jet fluid into the second port. I am going to embed a short video of a commercial down-hole video and am not endorsing anything but the animation shows you how the jet pump works. (And the flow in the Gulf is easier than that shown here ). Flow control is achieved, simplistically, with a valve at the top of the riser on the Enterprise. By adjusting the flow the valve effectively controls the pressure at the top of the riser and thus also at the bottom. Incidentally in other circumstances jet pumps are neat tools. One of my students developed a high pressure one for use in lifting high-level radioactive waste out of nuclear waste storage tanks (you want to minimize water use, and do this by upping the driving jet pressure). Worked like a charm, when used in the real tanks. They are also used as remote inexpensive pumps in mines, lying in depressions where water can collect. The water collects, a float valve lifts and the jet flows, sucking the water away. As the water disappears, the float drops and the jet switches off. Oh, and for those who have ideas on how to deal with any part of this problem, the Government is stepping up the ways in which you can get funding. The process goes through the Federal Business Opportunities Webpage where there is a Broad Agency Announcement on the subject. It would be more fruitful to contact them. 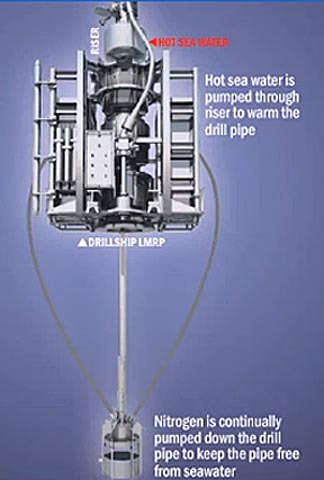 Interesting that the Drillship has an LMRP also (shown in the diagram above). Makes sense as it obviously protects the drillship from a potential further blowout, since the original well BOP is now defunct. A small break for dinner - BP risotto? ?